After extending its coverage within Europe, Jobfeed has finally crossed the Atlantic! Jobfeed is now available in the US, providing recruitment and HR professionals with the tool so many in Europe have already adopted. With closer ties to the US since Careerbuilder acquired a majority share in 2015, Textkernel has been increasing its presence on the American continent. The launch of Jobfeed US is a logical step towards developing its business in the States by offering an online searchable database of jobs published by US direct employers as well as staffing and recruitment agencies. In the long run, Jobfeed US will become an even more valuable tool, as it amasses data over the years allowing for detailed analysis of trends over time on the US job market. 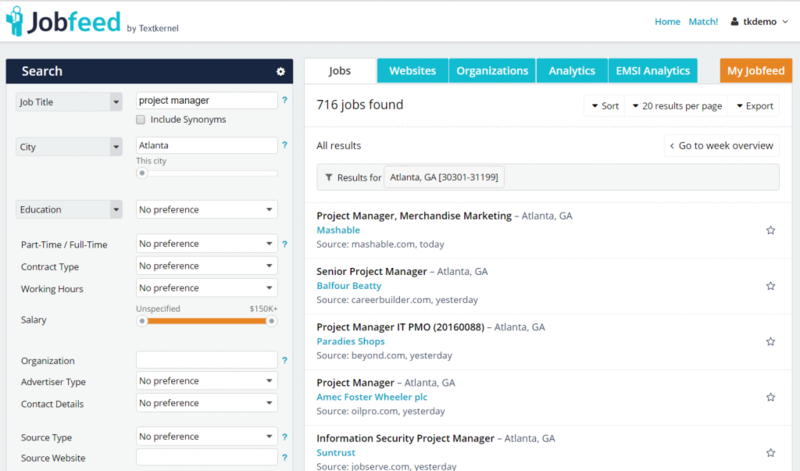 Jobfeed is Textkernel’s Big Data tool for jobs that automatically searches the Internet for new job ads every day. The jobs found are automatically entered in Jobfeed and classified by criteria such as profession, required qualifications, location and company name. The user-friendly Jobfeed portal makes it easy to search for all jobs, produce analyses, identify sales leads and set up job alerts. If you want to find out more about Jobfeed or test the tool yourself, contact us directly!